422 million adults live with diabetes, mainly in developing countries. WHO calls for global action to halt rise in and improve care for people with diabetes. Geneva: The number of people living with diabetes has almost quadrupled since 1980 to 422 million adults, with most living in developing countries. Factors driving this dramatic rise include overweight and obesity, the World Health Organization (WHO) announced. The WHO is issuing a call for action on diabetes. In its first Global report on diabetes, WHO highlights the need to step up prevention and treatment of the disease. 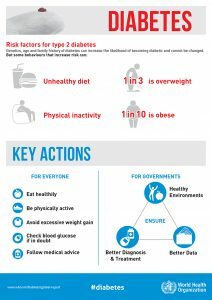 Measures needed include expanding health-promoting environments to reduce diabetes risk factors, like physical inactivity and unhealthy diets, and strengthening national capacities to help people with diabetes receive the treatment and care they need to manage their conditions. Diabetes is a chronic, progressive NCD characterized by elevated levels of blood glucose (blood sugar). It occurs either when the pancreas does not produce enough of the insulin hormone, which regulates blood sugar, or when the body cannot effectively use the insulin it produces. Among the key findings from the Global report on diabetes are: – The number of people living with diabetes and its prevalence are growing in all regions of the world. In 2014, 422 million adults (or 8.5% of the population) had diabetes, compared with 108 million (4.7%) in 1980. – The epidemic of diabetes has major health and socioeconomic impacts, especially in developing countries. – In 2014, more than one in three adults aged over 18 years were overweight and more than one in 10 were obese. – The complications of diabetes can lead to heart attack, stroke, blindness, kidney failure and lower limb amputation. For example, rates of lower limb amputation are 10 to 20 times higher for people with diabetes. – Diabetes caused 1.5 million deaths in 2012. Higher-than-optimal blood glucose caused an additional 2.2 million deaths, by increasing the risks of cardiovascular and other diseases. – Many of these deaths (43%) occur prematurely, before the age of 70 years, and are largely preventable through adoption of policies to create supportive environments for healthy lifestyles and better detection and treatment of the disease. – Good management includes use of a small set of generic medicines; interventions to promote healthy lifestyles; patient education to facilitate self-care; and regular screening for early detection and treatment of complications. These include meeting the Sustainable Development Goal (SDG) target 3.4, which calls for reducing premature death from NCDs, including diabetes, by 30% by 2030. Governments have also committed to achieving four time-bound national commitments set out in the 2014 UN General Assembly Outcome Document on NCDs, and attaining the nine global targets laid out in the WHO Global Action Plan for the Prevention and Control of NCDs, which include halting the rise in diabetes and obesity. “Around one hundred years after the insulin hormone was discovered, the Global report on diabetes shows that essential diabetes medicines and technologies, including insulin, needed for treatment are generally available in only one in three of the world’s poorest countries,” says Dr Etienne Krug, Director of WHO’s Department for the Management of NCDs, Disability, Violence and Injury Prevention. “Access to insulin is a matter of life or death for many people with diabetes. Improving access to insulin and NCD medicines in general should be a priority.” Global efforts are underway to make medicines, including for NCDs, more available and affordable. Commitments from world leaders, including the SDGs, the 2011 UN Political Declaration on NCDs, the 2014 UN General Assembly Outcome Document on NCDs, and the work of the UN Secretary General’s high-level panel on access to essential medicines are aimed at improving affordability and availability of essential drugs for people living with diabetes. Note to the editor: There are three main forms of diabetes: type 1, type 2 and gestational diabetes. The cause of type 1 diabetes is unknown and people living with it require daily insulin administration for survival. 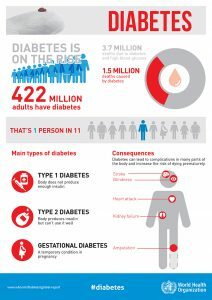 Type 2 accounts for the vast majority of people living with diabetes globally, and is largely the result of excess body weight and physical inactivity. Once seen only in adults, type 2 diabetes is now increasingly occurring in children and young people. Gestational diabetes is a temporary condition that occurs in pregnancy and carries long-term risk of type 2 diabetes. It is present when blood glucose values are above normal but still below those diagnostic of diabetes.